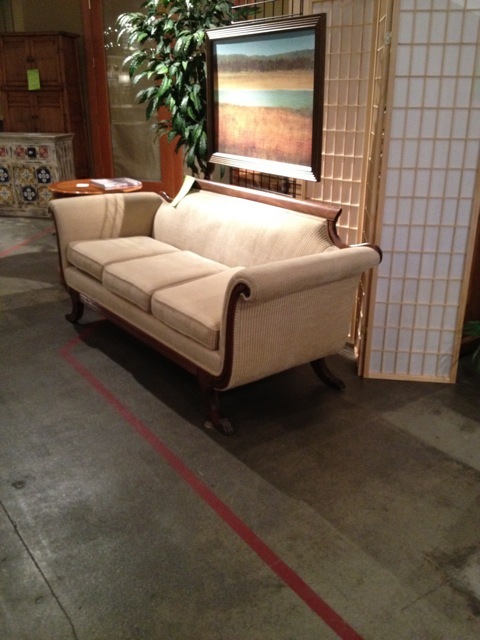 Scravings: I Bought a Couch! until a few days ago! 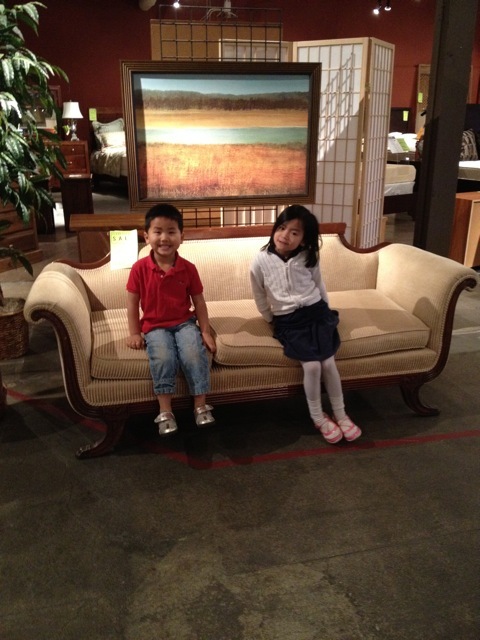 On President's Day, Lyle and I looked at seemingly every couch in our county. I had something pretty specific in mind-- a comfy couch with durable fabric in the tan color family, something that had no skirt around the bottom and showed some leg, and a couch that maybe had some curves and looked a little formal. We found a couple of couches that would work, but nothing really got us excited about forking out the cash required to bring them home. Then on Tuesday, I had a few minutes to kill before dropping the littles off at school and remembered an small furniture store nearby that I hadn't checked in years. By this point in my couch quest, I was a very impatient shopper and fast walked through the store while the kids jogged behind. Then I saw it. It was tan. It was curvy. It showed legs. I was afraid to sit on it. No matter how lovely, I would not buy an uncomfortable couch. It's an antique that had recently been reupholstered and resprung (is that a word?) but had a couple of dings on the wood frame. I pointed out the dings to the salesman and talked him down to a price less than any of the ho-hum couches we'd looked at. but with a leather recliner for Lyle. Franklin will never be allowed in the music room. Like the couch....also think Franklin would look really cute on it! Franklin doesn't even get to sit on the falling apart squishy couches, so he can forget about this couch! I hardly even let my kids sit on it! It's beautiful and so unique!